With deep sorrow, the family of Andrew Richard Kana announces his passing that occurred on November 12 at the age of 36 years. Andrew will be lovingly remembered by his daughter, Abagail Kana; parents, John and Ginger Kana; twin sister Angela Kana-Veydovec, brothers Peter Kana, Timothy Kana, and Christopher Kana; and sisters Kyndol Ray and Lesley Kana. Andrew will also be fondly and forever remembered by his life-long friend Billy Struble. 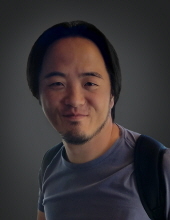 Andrew was born in South Korea and adopted and raised in Ponca City. He attended First Lutheran School and Ponca City High School and later went on to pursue a successful career in welding. Andrew took pride in his career; his friends compared his welding skills to that of a machine. He enjoyed coaching soccer, fishing, camping, listening to Christian and country music, and spending time with friends. Most importantly, he loved being a father. A public viewing will be held on Monday, November 19, 2018 from 8:00 a.m. to 5:00 p.m. at Trout Funeral Home in Ponca City, Oklahoma. All are invited, and donations and flowers will be welcome. There will be no public ceremony. Those who so desire may make memorial donations in memory of Andrew to the charity of their choice. To send flowers or a remembrance gift to the family of Andrew Richard Kana, please visit our Tribute Store. "Email Address" would like to share the life celebration of Andrew Richard Kana. Click on the "link" to go to share a favorite memory or leave a condolence message for the family.